How First Step Staffing in Atlanta, GA leverages Uber for Business to bring clients to and from work. Finding a job is not as simple as searching online or seeing a “help wanted” sign in a window for Atlanta’s homeless and at-risk men and women. Roadblocks such as adequate, reliable transportation can make or break employment for veterans, returning citizens, and individuals who recently experienced homelessness. 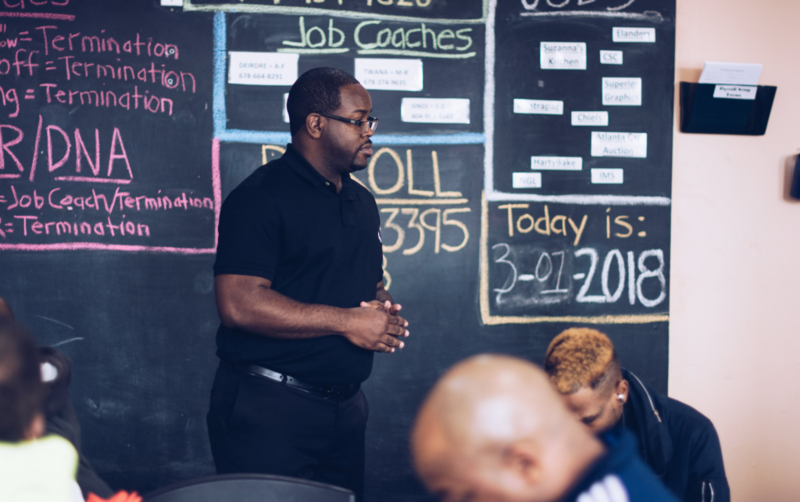 When First Step Staffing launched its job placement program in Atlanta in 2007, they built rides to work into the program, understanding transportation’s crucial role to retaining employment. The social enterprise, now the largest nonprofit commercial staffing organization in the country, has placed more than 7,500 individuals since launch, paying $15.8 million in wages last year. For the majority of clients, these job opportunities would not have been possible without the support structure provided by First Step Staffing’s transportation program. In First Step Staffing’s home base of Atlanta, many of the most economically disadvantaged populations are located in parts of the city where they have access to affordable housing and social service organizations. However, many job sites are not in these same areas, are inaccessible by public transportation, and car ownership isn’t an option for most clients. Without a guaranteed way to get to work, clients could not keep their new jobs without rides to and from work, and without their jobs, Atlanta’s most vulnerable could slip back into at-risk situations. At first, First Step Staffing managed a fleet of vans, along with all the overhead that came with it, to transport hundreds of clients. Managing a fleet was difficult for a small staff, especially because transportation routes, needs, and numbers of people fluctuated dramatically daily, and even from hour to hour.Adding a scalable option was key to sustaining this vital transport program. Uber Central as part of Uber for Business provides the technology necessary to order rides at a moment’s notice around the clock. Through an online dashboard, Uber rides can be requested for clients either immediately, scheduled in advance, or a link sent to request when the client is ready to ride. On any given weekday, Mike Simmons, First Step Staffing’s dispatch manager, checks in each client bright and early at 5 a.m. For three straight hours, Simmons modifies existing reservations, destinations, and vehicle size through the Uber Central dashboard, based on that day’s check-in. About half the day’s transportation is scheduled the day before; the rest is booked the morning of, on the fly, depending on need. Using Uber Central allows First Step Staffing to remove the overhead and liability of vehicle ownership while providing vital flexibility to accommodate last-minute changes. And simplified logistics means more time to focus on what truly matters: helping Atlanta’s economically-disadvantaged get to work. “Using Uber–and the Uber Central app–is more efficient than our previous transportation system because we’re able to ‘stack’ numerous vehicles and destinations in a tighter time window, which allows us to have a better control of departure and arrival times,” said Mike Simmons, First Step Staffing’s dispatch manager. Now, more than half of First Step Staffing clients each week go to and from work using Uber. “Uber has proven to be a critical tool for linking our homeless and at-risk clients with available jobs and ensuring that our clients arrive on time to our customers,” said Simmons. Scalable solution for client rides: With Uber Central as part of Uber for Business, the dispatch manager can modify existing requests and add additional rides on the fly, depending on client transport needs. Easy billing and management: First Step Staffing can see all rides taken at a glance, track usage over predetermined time periods, and bill all rides to once central payment method. Reduction in shuttle overhead: Uber for Business gives First Step Staffing access to a scalable transport solution, without the overhead and liability of vehicle ownership. A multi-city transport solution: With coverage in over 600 cities, Uber for Business allows First Step Staffing to expand their offering in new markets with ease. First Step Staffing provides subsidized rides to its clients. The small fee is not expected up front and is deducted from the client’s paycheck, a part of ensuring sustainability and ownership of the new position and its associated transportation costs. First Step Staffing believes the only way out of homelessness is sustainable income, and now, they’re bringing their vital infrastructure to help those who are economically disadvantaged in cities across the United States, with offices in Philadelphia and Nashville now open. Expansion plans are now underway for additional cities, including Chicago and Los Angeles. And when veterans, returning citizens, and those who recently experienced homelessness apply for employment in these new cities, Uber for Business will be along for the ride. Read Uber’s original article here. Philadelphia Business Journal – Philadelphia businesses can help fight homelessness. Here’s how. The Seattle Times – What can Seattle learn from cities where homelessness has dropped? Copyright © First Step. 2019 • All rights reserved.